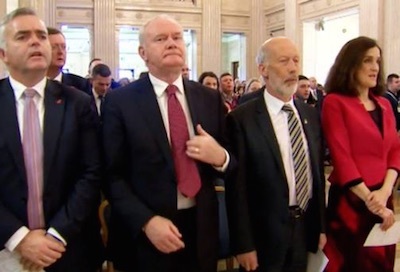 Sinn Fein has accused unionists of embarrassing Deputy First Minister Martin McGuinness by making him stand for a rendition of ‘God Save the Queen’ at a Poppy Day event at Stormont. This was the first time a service to commemorate the British war dead was staged in the Great Hall at Parliament Buildings, in what was designed to be an “inclusive” event for the television cameras. The Six County Assembly was lit up in red as a further honour for the British Army. At the conclusion of the event, one hardline TUV unionist began singing the British national anthem, and was immediately joined by DUP Assembly members and British officials, including British Direct Ruler Theresa Villiers. Deputy First Minister Martin McGuinness slowly rose to his feet, glaring angrily at a BBC television crew. The SDLP deputy speaker John Dallat also rose for the anthem, as did Sinn Fein culture minister Caral Ni Chuilin. Ulster Unionist Party leader Mike Nesbitt approached Ms Ni Chuilin after the event and said he was sorry for what he also described as a “stunt”. Later, he said it was “highly regrettable” that some nationalists felt “ambushed” by the singing of the anthem. “The national anthem should be part of the ceremony, but everybody should know and it should be part of the running order,” Mr Nesbitt said. The scene was broadcast by the BBC, drawing condemnation by nationalists. A number of assembly employees took issue with the event, alleging it was a violation of their right to a neutral work environment under the 1998 Good Friday Agreement. The commemoration itself was led by Sinn Fein assembly speaker Mitchel McLaughlin, who earlier this week announced his retirement from politics. Ms Ni Chuilin dismissed the anthem incident a “childish stunt”. “It was disappointing that some unionists chose to disrespect the spirit of the event with a childish stunt in an attempt to embarrass those in attendance,” she said. The SDLP’s Alban Maginness said it was unfortunate that some of those taking part in the service “sought to change the tone”. Alliance leader and Justice Minister David Ford, however, said the event was “extremely positive” and “moving”. DUP chief whip Peter Weir said such events always close with ‘God Save the Queen’. “Those of us who participated in the spontaneous singing of the national anthem this year did because it is normal for the anthem to be sung at such events,” he said.